Bert Carson - writer: This Is Your Life. Or Is It? 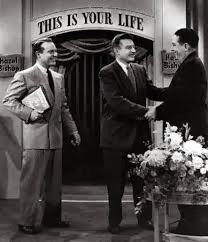 Every week from 1952 until 1961, Ralph Edwards, the producer and host of the TV show, This Is Your Life, surprised someone before a live audience with the announcement, "This is your life." Following the announcement, everyone moved from the place where the surprise was presented, to the This Is Your Life Studio, where for the next half hour Edwards turned pages in the large red book with their name embossed on the front, as he told stories of their trials and tribulations. At many points during his recitation, guests were introduced from the subject's past. The guests from the past were unidentified, hidden offstage and told a personal story that was heard by the subject and the audience. Then Edwards would give some clue to the identity of the speaker and ask the subject if he or she could identify the person who had played such a big part in their life. I didn't miss many of the shows and I can still remember marveling at how many of the subjects couldn't place the voice of the person who appeared to have been prominent in their life. For example, I just watched an old clip of the show where General Omar Bradley, a hero of World War II, was surprised, regained his composure, and listened to a voice from his past he had not heard in twenty-five years. The voice belonged to the man who drove the General for almost five years during the war. General Bradley couldn't identify the voice, and when he heard the man's name, it seemed to me that he had no recollection of him, but he faked it well and the show went on. As I watched that old clip, I finally realized why the subjects so often couldn't remember the hidden person who was speaking of an important period of the subject's life. The period of time recalled by the guest was important to the subject, however, the guest wasn't. General Omar Bradley was General Dwight Eisenhower's Chief of Staff during WWII. Who drove his Jeep obviously wasn't someone who made an indelible mark in his memory. That isn't cold nor callous. That's just the way things are. There are many people who have played what they believe were profound roles in your life, yet you cannot recall them or their names because, from your point of view, they weren't instrumental. We each pick the events and the people that mold our lives—let me say that again in a slightly different way—we pick the people who matter in our lives. Before you stop reading, let me tell you, how it works, then take a look at your life and you'll see it. We arrive here from a place we have little memory of, nor do we have a recollection of the trip. We come in with some basic equipment, which for quite a while is unimportant to us: race, gender, culture, etc. Our only concern is survival until we can figure out what is going on. From our first breath, we are surrounded by strange, loud, creatures, who, in a language we have no understanding of, introduce themselves, tell us who they are, what they mean to us, what is important and what isn't. As soon as we have a weak grasp of the language, they begin to predict our future and reinforce their predictions with the historic logic of the clan we are now members of. It's too much. We don't know these creatures. We don't even know ourselves. We don't have a clue what they are talking about and don't know how to start figuring any of it out. That's why we have no recollection of the first two or three years of that time, not because we're stupid, but because everything is foreign and we only have a vague idea of what went on before which is fading by the moment. Finally we hit on a way to survive in this strange place, populated by strange people, with even stranger stories they've shared as truth. We decide the only way we'll survive this is to create a self-identity. The logical starting point in the process is to emulate the less objectionable of the creatures that surrounded us. In the process we adopt some of their ideas, and without realizing it, we begin to incorporate their prediction for our future into our fabricated identity. So unconsciously we began to facilitate that forecast. Think of it this way, we arrived here one with all that is, and gave up our oneness when we created a personal identity based on faulty information furnished by other universal beings who had forgotten who they were. This isn't our life. It's a story we've made up, turned into a screen play, and opened on a stage we call our life. It's time to look beyond the script, the footlights, and the stage, and remember the truth of who we are - this is not our life.